Lampe Challenge - an invitational tournament in Stockholm. Hammarby Basket and Haga Haninge is proud to arrange Lampe Challenge for the 15:th time. - Maciej Lampe, the first player raised in Sweden drafted for the NBA, is the protector of the tournament. Maciej Lampe played for Polisen/Hammarby in the start of his career. 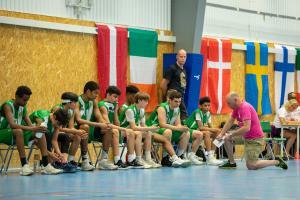 - "Challenge" because it is an invitational tournament where Hammarby Basket and Haga Haninge invites teams from various countries. Lampe Challenge is an international tournament with some of the best teams from the nordic countries, northen europe and around the Baltic sea. Our aim is to show Stockholm/Farsta/Haninge at its very best and our ambition is to make this tournament into a great experience for players, coaches, referees, officials and anyone who wants to come and watch great basketball performed by the big stars of tomorrow. "Youth Basketball - for those who demand entertainment!"